Seeking Alpha: The MoviePass Narrative Has Evolved. I Am Long. A simple reflective question made me reassess my initially bearish position on the comany - Will it be around in a year? The company could stand to benefit from a range of revenue verticals, some of which would have a material effect on its financial story. The risk/reward is skewed to the upside at the current price. The aftermath of my Helios and Matheson Analytics's (HMNY) MoviePass article; "Can A Flawed Business Model Generate Investor Returns? An Empirical Analysis Of MoviePass" was to be expected. Bulls sought to defend their position, bears theirs, and words like "shill" and "manipulator" got thrown around. However, in the midst of this a simple question made me reassess my entire bearish premise; will MoviePass be around in a year? This was a watershed moment in my opinion towards the company. At face value, it is a very basic question. Bears will either answer no, go short! Or yes, go short! However, when I sought to answer it, I was fully converted to a bull. I thought it would be prudent to write an article exploring the findings from my answer to this question as I placed an order with my broker to buy a considerable amount of calls. This article will explore how I have come to join the ranks of individuals initially described as being induced with "FOMO induced haze". MoviePass should not be thought solely as a movie ticket subscription company. While its subscription offering for moviegoers could potentially break even and become profitable, central to its long-term growth is selling movie marketing-as-a-service. LOS ANGELES — As streaming services like Netflix and Hulu surge in popularity, movie theaters have been trying to compete by rethinking the concession counter and installing seats that resemble beds. Yet attendance was flat at North American cinemas in 2016, and analysts are predicting a 4 percent decline in 2017, bringing ticket sales to a 22-year low. Perhaps something more radical is necessary. Mitch Lowe, a Netflix co-founder, certainly thought so when he took over a ticketing firm called MoviePass in June 2016. By August of this year, when MoviePass introduced a cut-rate, subscription-based plan — go to the movies 365 times a year for $9.95 a month — Mr. Lowe had been declared an enemy of the state. “Not welcome here,” AMC Entertainment, the largest multiplex operator in North America, said in an indignant August news release that threatened legal action. Dan Steven using his MoviePass to buy a ticket this week at the AMC Disney Springs 24 theater in Lake Buena Vista, Fla. It may be time to get on board: MoviePass said this month that it had signed up more than one million subscribers in just four months. It took Netflix more than three years to reach that level when it started selling low-priced subscriptions for DVD rentals in 1999. Spotify was relatively quick, at five months in 2011. It took Hulu 10 months to reach one million later that year. Mr. Lowe and Ted Farnsworth, chief executive of Helios and Matheson Analytics, which bought a controlling stake in MoviePass in August for $27 million, celebrated the milestone by cheekily posing for photos at an AMC theater in Times Square. Mr. Lowe, who previously sparred with studios as president of Redbox, the kiosk company that rents DVDs for $1 a day, believes that ticketing can at least be a break-even business for MoviePass. The real treasure in this venture, he contends, is the trove of data about consumer tastes and habits that MoviePass can collect. It hopes to sell that data to studio marketers. Helios recently raised $60 million for the expansion of MoviePass, which expects to have more than three million subscribers by the end of next year. Monthly subscriber retention is roughly 96 percent, Mr. Lowe said. About 75 percent of MoviePass users are millennials, a group that Hollywood has struggled to turn into avid moviegoers. “Millennials understand us because they grew up on subscription,” Mr. Lowe said. Dan Steven, 34, signed up for MoviePass in October. Mr. Steven, who lives in Orlando, Fla., said he had gone to “maybe one movie a month” before he became a subscriber. In November, he went 12 times. Over the last decade, theaters have spent billions of dollars to enhance the moviegoing experience. Improvements include the ability to reserve seats online, reclining seats, bigger screens, and better sound and projection systems. But the business has remained more or less the same for decades (sell ticket, serve popcorn, show movie) even as nearly every other area of media (television, music, publishing) has been forced to reinvent itself to contend with digital disruption. As the popularity of MoviePass demonstrates, theater owners may no longer be able to avoid fundamental change. In particular, studios are expected to force exhibitors in the coming months to loosen their grip on new movies. Theaters have typically insisted on a 90-day period of exclusivity. Studios want to shorten that window and speed films to home video-on-demand services. “This is something that has to happen, in part because consumers are demanding it,” Jim Gianopulos, chairman of Paramount Pictures, said at an investor conference in September. MoviePass, which has been around since 2011, struggled to gain traction in its early years because of pricing ($50 a month, later lowered to $35) and pushback from exhibitors, who worried that a subscription service would undermine per-ticket pricing. 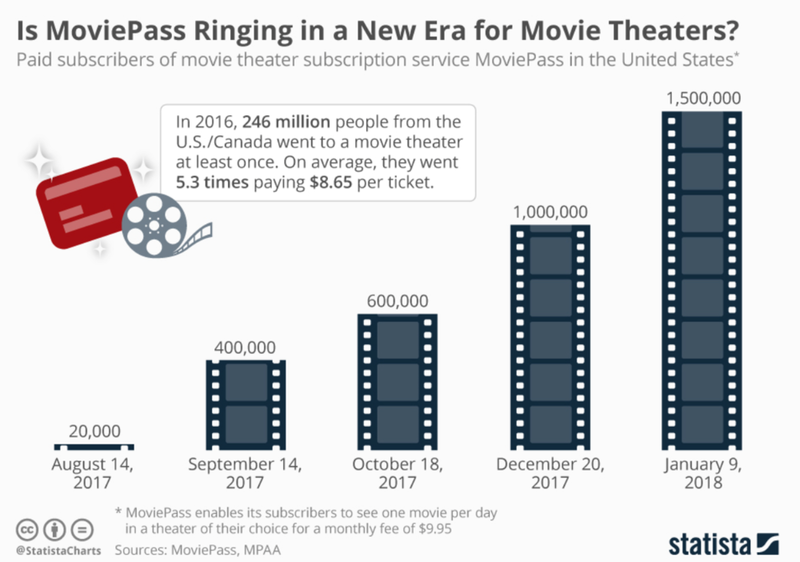 By early 2017, MoviePass was trundling along as a fringe service; it had about 20,000 users in the United States. When Mr. Lowe and Mr. Farnsworth drastically lowered the price, people started signing up en masse. To a degree, the service depends on traditional subscription economics: More people pay than go. The model starts to get more complicated, however, when you consider the price of movie tickets. According to the National Association of Theater Owners, tickets cost an average of $8.93. But theaters in cities like New York, Los Angeles and San Francisco charge as much as $16.50 for a standard ticket. At Mr. Steven’s local theater in Florida, they are $11.92. So far, none of the major studios have signed on as clients, and no studio executive contacted for this article would comment on the record. Mr. Lowe said MoviePass had been “making huge progress with content owners” and had signed up a small studio as a partner, but he declined to provide details. The big theater chains have held their ground, although AMC recently softened its stance. A bit.